Zimbabwe faces a grave constitutional crisis. For all the ambiguity in General Chiwenga's statement it challenges President Mugabe either to turn his back on his wife and other members of the G40 faction or to face the wrath of the military. In reality however it provides Mugabe with little choice - because the thought of Mugabe turning his back on his wife at his age, and in his state of dependence, is unthinkable. It would also be a grave mistake to think that this comes from a small or weak faction of the military. It is a significant fact that the Commander of the Army General Sibanda sat next to Chiwenga and reporters at the press conference have said that there were some 90 senior officers present. It appears that the only significant officers not present were Police Commissioner Chihuri and Airforce Commander Shiri (who I am told is ill). The presence of General Sibanda in particular demonstrates that at the very least a significant portion of the military oppose what is going on within ZANU PF, and consequently the decisions taken recently by President Mugabe. So although General Chiwenga did not overtly threaten a coup, and although he swore allegiance to President Mugabe, in reality the military have demanded that Mugabe reverse his various decisions or else there will be consequences. It is hard to see Mugabe backing down on the decisions he has taken, and therein lies the growing crisis - or the vortex of the perfect storm I have been speaking and writing about for 18 months. A critical question to be asked is what stance democratic forces and leaders of the opposition in Zimbabwe should adopt? There is a grave danger that some may delight in the crisis and rub their hands in glee at the dilemma President Mugabe has been placed in. That would be wrong in my view. Zimbabwe simply cannot afford to have a de jure or de facto coup; once any change of power in any Nation comes through a means other than the strict fulfilment of the Constitution, in letter and spirit, a dangerous precedent is set which is hard to reverse. It is important therefore that the opposition speak with one unequivocal voice that the military needs to stay out of politics and be confined to barracks. However that will not deal with the crisis our Nation faces, made worse now by this statement of discontent by the military. What then is the constitutional way out of this mess? I believe it is found in Sections 96 and 97 of the Constitution. If President Mugabe finds that his position has become untenable then he can resign in terms of section 96. Of course that is highly unlikely, and in that case the only remaining lawful and constitutional method is for President Mugabe to be removed from office in terms of section 97 of the Constitution. Section 97 states that where a simple majority of the Senate and National Assembly believe that the President should be removed from office because of serious misconduct, his failure to uphold the Constitution or his inability to perform the functions of office they are entitled to set a Committee representing all the parties in Parliament to investigate the President's removal. If that Committee recommends that the President be removed from office, then a joint resolution of the Senate and House of Assembly may vote to remove the President from office. If two thirds vote in favour then the President ceases to hold office. If that were to happen in this instance then section 14(4) and (5) of the Sixth Schedule will apply in selecting the President's replacement. These sections mandate that the person who was last Acting President shall take office for a period of 90 days whilst, in this case, ZANU PF selects a replacement from its own ranks to see out the term of office. That person would then be President until the next election scheduled to be held next year. In my view if President Mugabe refuses to accede to the military's demands this is the only lawful means for those within ZANU PF, who are annoyed by President Mugabe's recent decisions, to address the situation. The opposition of course will play a vital role in this if it indicates that it will support any resolution brought by ZANU PF members to remove President Mugabe from office. It seems to me that it will be relatively easy to get the initial simple majority in Parliament to start the impeachment process. 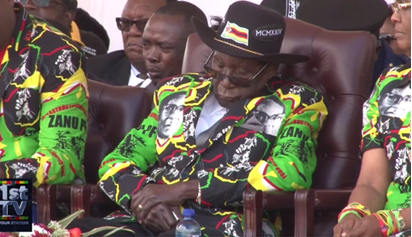 Furthermore I suspect that if all MDC T, MDC and Independent MPs and Senators joined forces with disaffected ZANU PF MPs and Senators (who quietly support both Mnangagwa or even Joice Mujuru) it may be possible for them to achieve the required two thirds majority to remove President Mugabe from office.